Are you the administrator or manager of a Facebook business page? Have you noticed a significant drop in your organic reach? Well unlike Tom Hanks in Castaway… you’re not alone. For over a year now there has been report after report of Facebook algorithmically decreasing the number of people who see your Facebook posts. Some companies have gone as far as to say they’re shutting down their Facebook page. This isn’t like GM dropping their Facebook advertising a few years back, this is a company completely leaving Facebook behind. With so much negative press around this not-so-recent move by Facebook, many people are asking why? How is Facebook decreasing organic reach? The drop in organic reach on Facebook business pages isn’t a conspiracy theory put out by marketers. 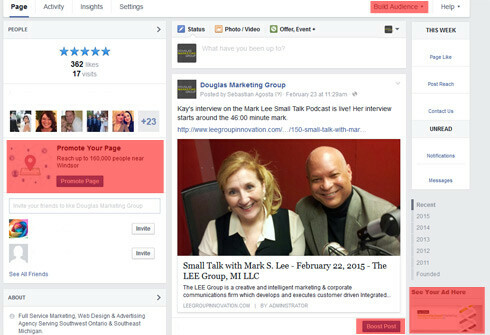 Facebook has openly stated that they are dropping the organic reach of business page posts. How they’re doing it is mostly through algorithms. At one point they called this algorithm EdgeRank but have since moved away from using this term. Essentially, from the second you post a story on your business page, it’s being “monitored” by Facebook. And “by Facebook” I mean by an algorithm. No one knows the exact queues Facebook looks for to deem a post “promotional” or popular or worthy of more views but it is believed it has a lot to do with how much engagement that post receives within the first minutes of it being posted. If your post receives great engagement (a “Like”, a share, a comment or a click on a link) with the first few people who read it, it is more likely to show up for the rest of your Facebook Fans. Believed queues other than engagement include: unique content, have you posted this exact thing on Facebook before, is your content more promotional than useful and does your post include a photo, link or video. Another small but important thing to note is that most people who use Facebook use the default News Feed setting of “Top News” rather than “Most Recent”. What people don’t realize is that by sorting their News Feed by “Top News” they are allowing Facebook to dictate which posts appear at the top of their News Feed by both friends and businesses alike. By setting your News Feed to “Most Recent” you are more likely to see everything your friends and business pages post rather than what Facebook thinks you want to see. Why is Facebook decreasing organic reach? As mentioned in my opening, with so much negative press around the decline in organic reach, why would Facebook decide to do such a thing? Well there are three reasons, two reasons Facebook is willing to admit and one (conspiracy theory) reason most people in marketing believe. The two reasons Facebook admits: 1) Amount of content produced and displayed in News Feeds and 2) Competition within the News Feed itself. No sense in me breaking down these two reasons here because Facebook has done a great job explaining it themselves here. The third (conspiracy) reason is that Facebook would rather see you purchase a Boosted post ad and help increase their revenue rather than give it to you for free. This reason makes perfect sense why you being to realize a few things. First of all, Facebook is a business, it’s publically traded on the stock exchange and needs to generate revenue to sustain itself. It makes perfect sense that at some point they were going to charge business to advertise on their network. Secondly, Facebook is really, REALLY pushing business pages to promote on their site and are making it easier to do so every day. Just take a look at your business page to see what I’m talking about (or check out the highlighted red areas in the image below). What can you do to combat the decline? First and foremost you have to start creating unique, engaging and remarkable content targeted directly at your fan base. The days of sharing dated blog posts from sources other than yourself are long gone. If you want real engagement, make sure your post is unique, has a high quality image and well written descriptive text. Secondly, you need to get a better understanding of your target audience. Take a look at the type of Fans who regularly engage with your content and tailor your posts to those Fans. What is the best time to post to your Fans? What type of content do they engage with most? Is it picture based posts, funny posts or educational posts? All of these factors will come into play when determining what type of unique content you share on your page. Lastly, you may have to bite the bullet and set aside a small budget to promote your posts using Facebook’s very useful and very targeted ad tools. The tools themselves can be a bit tricky to use at first but if used properly even a small budget can expand your reach exponentially. My only caution is that if you haven’t purchased online ads before and terms such as CPC, CPM and CTR are foreign to you, you may want to hire a marketing agency with some experience to help get you started. Social media marketing isn’t free anymore. While I’ve spent this entire post picking on the fact that Facebook has declining organic reach numbers, the truth is this is happening across almost all social media networks. At some point in their business life cycle, these social media sites need to start making money and what better way to do so than to charge businesses to advertise to their huge user base. Don’t let this discourage you. With the right strategy, plan, schedule, content and advertising budget; social media is still a great way for small and large businesses to gain a following and turn those engaged Fans into satisfied customers.